In this picture, workers are readying the propulsion module for NASA's Juno spacecraft bound for Jupiter. Assembly began April 1, 2010, in Denver, Colo. Launch is set for August 2011. NASA has begun assembling its new Juno space probe in preparation for a mission to Jupiter to help scientists understand the origin and evolution of the largest planet in our solar system. The assembly, testing and launch preparations phase for the Juno spacecraft began on April 1 at Lockheed Martin Space Systems in Denver, Colo. Engineers and technicians will now spend the next few months fitting instruments and navigation equipment onto the spacecraft. The mission, led by astronomer Scott Bolton of Southwest Research Institute in San Antonio, Texas., is slated to launch in August 2011 and reach Jupiter in 2016 [photos of Jupiter]. Jupiter, a gas giant, is the largest planet in the solar system. Underneath its dense cloud cover, the planet safeguards secrets to the basic processes and conditions that governed out solar system during its formation. As our primary example of a giant planet, Jupiter can also provide critical knowledge that will help scientists understand the planetary systems that are being discovered around other stars, mission scientists said..
NASA's Juno mission is the first dedicated mission bound for Jupiter since the Galileo probe launched in 1989. Galileo?s flight ended in 2003, when the aging probe was intentionally crashed into the gas giant to be destroyed in the crushing pressure of its intense atmosphere. Unlike Galileo, which was powered by a nuclear radioisotope thermal generator, Juno will draw power from wing-like solar arrays. The new spacecraft will carry nine science instruments on board to investigate the existence of a solid planetary core, map Jupiter's intense magnetic field, measure the amount of water and ammonia in the deep atmosphere, and observe the planet's auroras. "We plan to be doing a lot of testing in the next few months," said Jan Chodas, Juno's project manager based at NASA's Jet Propulsion Laboratory in Pasadena, Calif. "We want to make sure the spacecraft is ready for the long journey to Jupiter and the harsh environment it will encounter there." 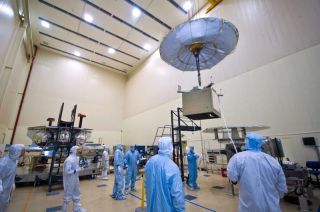 Lockheed Martin Space Systems is building the spacecraft for NASA and the Italian Space Agency in Rome is contributing an infrared spectrometer instrument and a portion of the radio science experiment.